ITP 2.0 - Make the Most of your Wireless Workflow! Toronto, ON - October 14th, 2005 - We are happy to announce the release of ITP version 2.0! This new version brings a host of powerful new features to help users get the most out of their wireless transmitters. Powerful features like automatic image processing, image review and analysis, live slideshows and memory card synchronisation provide users with many more ways to get their work done faster and better. Additionally, a wide array of new ease of use features make setting up a wireless transmitter easier than ever! Pixagent has always strived to make the setup and use of a wireless image transmitter as simple as possible. ITP 2.0 is no exception, adding a new adapter management system that helps to configure network adapters for receiving images. This system saves the user from having to manually enter complex TCP/IP settings on the host computer. It also adds a built-in DHCP server so that your camera can automatically retrieve settings over the network. Building on the assisted configurator subsystem in previous versions, ITP 2.0 now offers full support for the Nikon WT-1 and WT-2, Canon WFT-E1 and WiPics transmitters. In addition to simplifying the configuration process, this system removes many potential sources of errors so that users can get up and running as quickly as possible. To further assist users, ITP 2.0 offers a new Control Centre interface that places the most commonly used options in a central location. Using a visually oriented interface users of all levels can quickly and easily administer the core functionality of this package. If necessary, more advanced dialogs are also available that provide access to many additional options that power users demand. The powerful new Professional edition of ITP 2.0 offers a number of additional workflow-oriented features including the new card synchronization system. This powerful feature allows users to seamlessly switch between wireless and wired workflows by intelligently downloading images from their memory cards. When a card is inserted into a computer, ITP 2.0 Professional will start off exactly where the wireless transmitter left off. In addition, ITP will treat these images in the same manner as if they were uploaded so that all of the other powerful features will work on all these images. To further enhance workflow, ITP 2.0 Professional offers a new automated processing engine. When enabled, this system will automatically trigger other software to process images the moment that they are received. Using this system many repetitive and time-consuming tasks can be performed in parallel with image capture stages. When users return to their workstations, much of this work will be already done for them. As a result, photographers can spend more time behind the lens and less in front of their computers. This is a powerful feature that has the potential to make significant improvements in the workflow of many photographers. In addition to these automation features, ITP 2.0 Professional also brings a number of powerful tools to assist photographers in the way that they work. The new live image review system will optionally display all incoming images for real time analysis. This allows studio photographers to evaluate their images with the full capabilities of their monitor moments after they are captured. In addition, clients and art directors can also provide immediate feedback without intervention by the photographer. As a result, more mistakes can be recognised on the spot, allowing photographers to correct for them faster and with less expense than ever before. Our new live slideshow system allows event and wedding shooters using ITP 2.0 Professional with the ability to show off their work as it is being captured! As images are received by ITP, they are immediately worked into the slideshow - allowing photographers to present their work while it is being captured. Combined with a large monitor or HDTV set, this system allows guests to see the images and potentially lead to impulse sales that would have otherwise been impossible. In addition, it allows photographers to provide an extra value service to their clients to rise above the competition. Control Centre Interface (New in 2.0) - ITP now provides a new control centre interface that provides centralized access to ITP's most commonly used features. These settings are presented in a visual manner to make it as easy as possible for anyone to understand the context and meaning of each control. If more complex changes are required, conventional settings dialogs are still available, however the control centre allows you to manage the core settings from one common location. Automated Processing (New in 2.0 Pro) - ITP 2.0 Professional can now be programmed to automatically trigger the processing of images the moment that they are received by the server. This system allows you to automatically perform many repetitive and time-consuming tasks while you are still out shooting. When you get back to your workstation your images will already be processed and you can focus on other more important tasks - allowing you to spend more time behind the lens and less time at your computer. Card Synchronization (New in 2.0 Pro) - The Professional version of ITP 2.0 can now synchronize your memory cards to allow seamless switching between wireless and wired workflows. When a memory card is inserted into your computer, ITP can now pick up where the wireless transmitter left off - downloading the images that are waiting to transmit while leaving those that have already been sent. Images retrieved in this fashion will be treated just as if they were sent via the wireless transmitter so all automation features will be in full force. Live Image Review (New in 2.0 Pro) - ITP 2.0 Professional can now generate full-screen displays of images the moment that they are received by the server. This powerful feature allows photographers to see the result of their shots using the full capability of their desktop monitors moments after being shot. Using this mechanism you can quickly and easily identify potential problems and fix them on the spot. Similarly, clients and art directors can see the results of your shoot in real time, allowing them to provide feedback in a convenient and efficient manner. Analysis Modes (New in 2.0 Pro) - ITP 2.0 Professional provides a number of image analysis modes that allow you to rapidly access any potential exposure problems with your images. Coupled with the live image review system, these modes quickly highlight potential issues so that you can repair them while it is still easy to reshoot. Live Slideshow (New in 2.0 Pro) - The Professional version of ITP 2.0 can now display a continuously updating slideshow incorporating new images as they are received. Using a large monitor or HDTV set, wedding and event shooters can show off their images while they are still being shot - allowing potential customers to see their images on the spot. This allows these photographers to deliver extra value features to their clients and potentially gather sales that wouldn't have been otherwise possible. Adapter Management (New in 2.0) - ITP now offers a number of features to simplify the setup of your system for wireless transmission. A new virtual IP address system attaches a second fixed IP address to your wireless network adapter - simplifying the setup process without disturbing your existing network settings. In addition, ITP also offers a built-in DHCP server that allows your transmitter to automatically retrieve network settings even when running on ad-hoc networks. Automated Support (New in 2.0) - You can now quickly and easily send support requests through the program itself. In addition to the message you enter, ITP will also transmit a copy of your settings (personal data will be automatically obscured) so that we have all the materials necessary to diagnose and solve your problem. Assisted Camera Configuration (New in 2.0) - Users can now quickly and easily configure a number of wireless transmitters from within ITP itself. Since the server knows many of the settings already, it simplifies this task by automatically filling in many of the fields for you. Additionally, when users are finished ITP will do a quick audit of your settings and provide you with warnings for many common mistakes so that they can be caught without having to upload the settings and figure out the hard way. This system is especially valuable to those without extensive networking experience, as it reduces the number of variables you need to worry about. Supported transmitters include the Nikon WT-1 and WT-2, Canon WFT-E1 and Dice America WiPics. ITP 2.0 is being offered in both a Professional and a Standard edition. ITP 2.0 Professional provides all of the powerful features mentioned above and is a commercial product that can be purchased directly from Pixagent for only $60USD. The powerful features contained in this version of ITP provide you with all of the tools necessary to make use of all the potential that your wireless transmitter offers. To help with your evaluation, Pixagent is offering a free one month trial of these features so that you can try them in your own workflow. The standard version of ITP 2.0 provides you with the core features necessary to get your wireless transmitter up and running. It lacks many of the workflow features of the Professional version, however it has everything you need to get a basic system up and running. Like previous versions of ITP, ITP 2.0 Standard is being offered at no charge. ITP is currently only available for Windows (98, ME, NT, 2000, XP and 2003) and PocketPC (PocketPC 2002, WM2003, WM2003SE) platforms. A Mac version is currently in the planning stages at this time, however it is still to early to provide any further information. After assisting many people in setting up their WT-1s we discovered many issues that people were having problems with. We released ITP 1.1 in an effort to help remove many of the stumbling blocks that caused people problems - making their experience with setting up the WT-1 much easier. 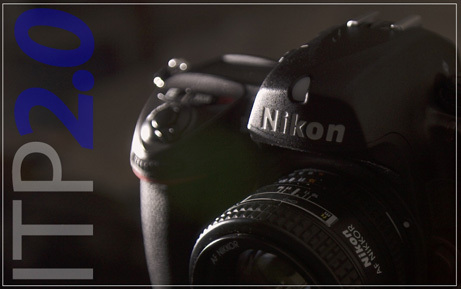 Our system is so effective that it has been recommended by Nikon's support divisions since it was available. ITP 1.2 was released several months later and added support for the Canon WFT-E1 wireless transmitter. This was followed shortly by PocketITP 1.2 to bring the same support to the PocketPC platform. These versions only made minor modifications to add support for the new transmitters. Our new ITP 2.0 products cement our strategy by providing a host of powerful new features to improve the workflow of photographers working with wireless transmitters. In addition, these new versions provide support for all currently available transmitters from Nikon, Canon and Dice America. We will continue to work on powerful new features in future versions that are already underway!